Background Story to the Return of the Alberni Indian Residential School Paintings. In 2008, the University of Victoria’s Legacy Art Galleries was gifted 700+ paintings created by Indigenous children between the late 1950s and early 1970s. The paintings were created in art classes taught by Canadian artist Robert Aller. Upon his death, his family gifted the massive collection of children’s art to UVic. The majority of the paintings were created by Ojibwe and Algonquin children who attended summer camps with Aller that were funded by the Department of Indian Affairs in the early 1970s. Prior to these camps, Aller volunteer taught in two residential schools: the Alberni IRS in Port Alberni, British Columbia and the MacKay IRS in Dauphin, Manitoba. Children who attended these two residential schools during the late 1950s and early 1960s created 136 paintings in the collection. In 2011 the Truth and Reconciliation Commission released a call for artworks about the residential school experience/legacy. Dr. Walsh contacted the TRC about the newly gifted collection of residential school art, and this resulted in a meeting with Justice Murray Sinclair, Chair of the TRC, who was travelling to UVic to give a public lecture in October of 2011. Between 2011 and 2012 Dr. Walsh worked with Elders and Survivors from the Elders in Residence program through First Peoples House to create a protocol for working with the paintings from the residential schools. They knew from the students’ research it was very likely the creators of the works were alive, and that these Survivors were unaware of the existence of the works. Or, in some cases, they knew they would need to respectfully and ethically exercise cultural sensitivity in the event that a person who created a painting had since died, and this might be traumatic for family and community to have a piece of art surface without prior knowledge of its existence. The Elders who guided this early work were Deb and Ron George, and Victor Underwood and his wife, the late Joyce Underwood. Dr. Walsh and the Elders consulted with Mary Jo Hughes of the Legacy Art Galleries and advised her of their proposal to reconnect the Survivors and families with the paintings. We were very encouraged by her vision to support the work of the Elders and Survivors in their use of protocol around the paintings. In addition, she consented to their proceeding with the work to locate individuals with the intent to repatriate the paintings to the people who created them as an act of reconciliation. It was decided that prior to any kind of academic or public engagement, Salish protocols and ceremonial work would be done to bless and cleanse the art, and to strengthen those who would work with the paintings. This work took a few months to complete. The Elders instructed Dr. Walsh to have a traditional woven Salish blanket created. In March of 2012 in Port Alberni this blanket was presented to the chief of the Tseshaht Nation on whose territory the former residential school had been located. 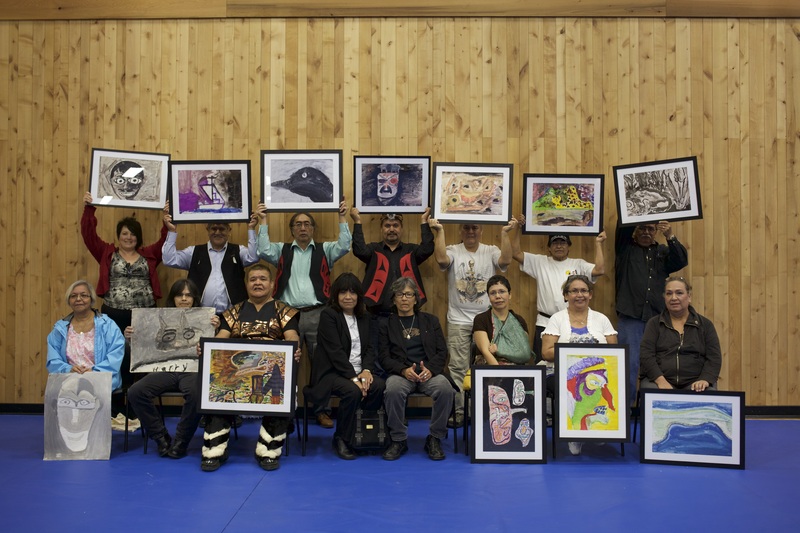 They gifted the blanket, and met with Nuu-chah-nulth Hereditary chiefs and cultural leaders to ask their permission to bring the paintings out into public at the TRC Regional Event in Victoria in April 2012. The chiefs granted permission on the basis that such an event would have “all the right people” in attendance. These people who included Survivors, their families, and communities from largely Vancouver Island and the lower mainland, might be able to help them to reconnect people with the paintings, and there would be cultural support for those who might be triggered by the artwork. At this meeting, too, Elder and Survivor Wally Samuel (Ahousaht First Nation) stepped forward as a project lead for the community to work with the UVic Elders and Dr. Walsh. Around this time, Qwul’sih’yah’maht (Dr. Robina Thomas, Social Work) joined their collaboration. She continues to bring to the work her strong background working with residential school Survivors as well as research methodologies with Indigenous communities. Commissioner Dr. Marie Wilson witnessed their meeting with the chiefs and leaders and their request to bring the paintings to the Victoria Regional Event. After the meeting, she invited Dr. Walsh to join a circle of Honorary Witnesses to the Truth and Reconciliation Commission. Dr. Walsh was inducted as an Honorary Witness at the 2012 Regional Event in Victoria where she gave an address to 1300 people who attended the final Call to Witness on the last day. Walsh chose to speak about the paintings and what they meant for reconciliation. The Alberni IRS paintings were brought out for the first time in almost 60 years at the TRC Regional Event in Victoria in April of 2012. Overwhelming response to the paintings created a desire in community to follow through with locating Survivors to repatriate the work to them or their families. This process took a year and a half of concentrated work with Survivor networks, and we managed to locate 90% of the people through Survivors family and social networks whose names were on the 50 paintings that were exhibited. In the spring of 2013 Dr. Walsh learned that monies were available from the TRC to hold “Commemorations” and she worked on behalf of the Survivors to secure $40,000.00 to hold a feast that would publically return the paintings to Survivors. For four months we worked on arrangements to bring Survivors and their families back to Port Alberni (some were back in their home communities as far away as Prince Rupert and in remote locations along the central coast). On March 30, 2013 we feasted at the Port Alberni Athletic Centre where 80% of the paintings from the Alberni IRS collection were repatriated in a ceremony that included the family of Robert Aller and had 400+ witnesses. For this return ceremony, the paintings were professionally photographed and printed onto archival paper with archival inks and framed. Reproductions were created because the original paintings are on pieces of newsprint paper, and fragile. Survivors could hang the reproduction in their home and store the original. However, at this ceremony, most Survivors accepted their paintings back in terms of ownership, but then publicly stated their desire to partner with the team at UVic. The paintings are now on long-term loan to the university from Survivors so that we may continue to research and exhibit the paintings in the name of education and reconciliation. A few of the Survivors who participated in the repatriation ceremony have their picture taken with framed reproductions of their childhood paintings. In September of 2013, the Commissioners for the TRC asked if it was possible to bring the paintings to the national event in Vancouver. The team of people now working on this project (faculty, Survivors and family, students, staff) were invited to address the closing ceremony audience about their work in what the TRC called a Gesture of Reconciliation. In the interim between the repatriation feast and the national event, Dr. Walsh and her team discovered another 25 paintings from the school. They decided instead of speaking about the work that been had done, they would use the opportunity to publicly return a painting to a Survivor at the event. With over 1000 witnesses, Survivors, university faculty, students, and staff, we returned to Mark Atleo of the Ahousaht Nation his childhood painting in a short ceremony. The team used the national event as an educational opportunity about their work. Survivors and UVic students sat for three days to speak with people at the educational display. 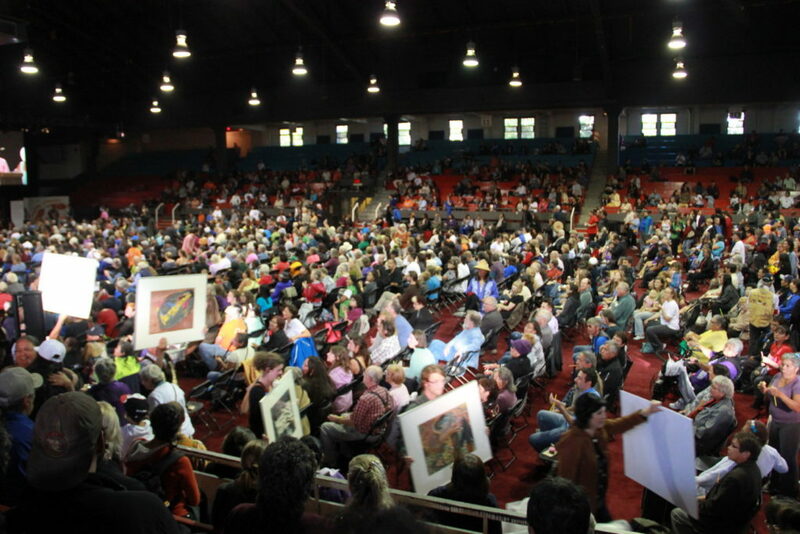 Over 4000 people walked through this education event, and many of them stopped and discussed the paintings and spoke to Survivors about the repatriation project. 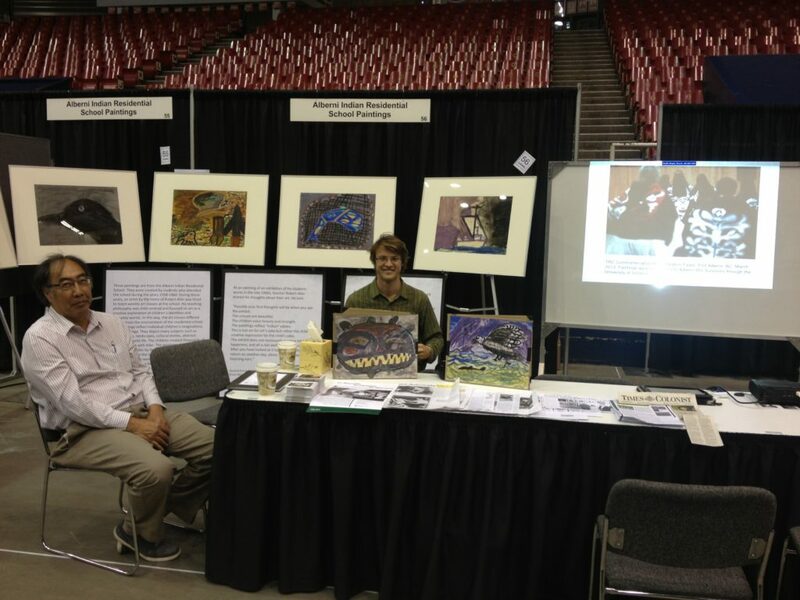 1000 witnesses to the repatriation of Alberni IRS Survivor Mark Atleo’s painting at the TRC National Event in 2013. In June 2015 Survivors who have been actively part of this work since the original meeting in 2012 and Dr. Walsh were asked to recount their repatriation story at the official closing of the TRC in Ottawa. On June 1, they presented their work at the Museum of History to the public as part of the official closing agenda of the TRC. To make this trip possible, Dr. Walsh fundraised outside of the university to acquire travel money for the Survivors and their families. 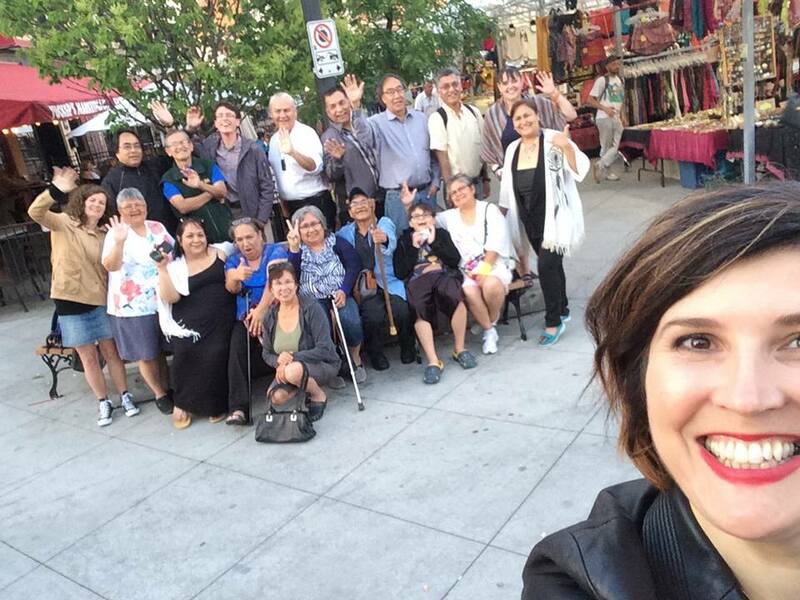 She raised $30,000.00 for this 4-day trip that had 17 people travelling to Ottawa. This group included UVic undergraduate and graduate students involved in this project. While in Ottawa, the Canadian Museum of History requested that the story of the paintings’ repatriation and the Survivors’ narratives of residential school be officially recorded for inclusion in its new Canada Hall that will be opened in 2017. The exhibition of Survivor paintings and the recorded videos will form a feature story in this new exhibition that educates visitors about “reconciliation” in the wake of the legacy of the schools. This exhibition at the Museum of History features the work of the collaboration between the university and Survivors, and it will run for an expected 20 years. The entire group of travellers to Ottawa for the close of the TRC and release of the final report, as well as work with the Canadian Museum of History. In January of 2016, Survivors Gina Laing and Jeffrey Cook presented this research and exhibition work together at UVic’s Diversity Research Forum. In 2016 and in 2017 the team was asked by the UVic Law School to attend a day of discussion of the TRC’s Calls To Action, and specifically speak about the role of repatriation and reconciliations between institutions and Indigenous peoples in Canada. The story of the repatriation of the paintings forms part of the Executive Summary Report of the TRC under “the Challenge of Reconciliation” (page 334 and 335). A photograph of three of the Survivors holding their repatriated paintings was featured on the front page of the Globe and Mail on June 2 when the Summary Report was officially released. The story of repatriation and reconciliation made headlines in March 2013 as well on the front page of the Globe and Mail and the Victoria Times Colonist after the repatriation feast in Port Alberni. Beyond newsprint, the story of the painting has been reported through interviews with Walsh and Survivors on CBC Radio and television, APTN and CBC.